Very cute, very colorful and very easy! This sweet little diaper cake is a darling example of a do-it-yourself baby shower project. Faith is one of our wonderful readers who shares her diaper cake project with us and she shares some helpful tips about how easy it was to do. 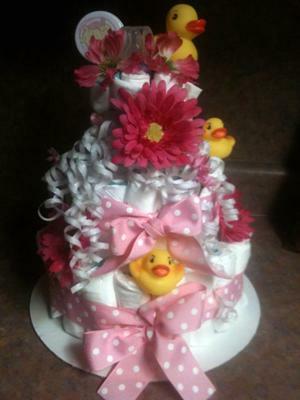 Our diaper cake gallery is loaded with advice, tips and photos of the cutest diaper cakes on the internet! Thanks so much for your diaper cake, Faith! It is so pretty! I used baby bottles for the inside of my cake layers. However many people don't use bottles so paper towel rolls work too. I think this cake took about 20 minutes to assemble so it is an easy project! this one is too cute!!! Faith from MO. I will use this idea!!!! Your's is one of the cutest I've ever seen. ADORABLE.. GREAT WORK. HAVING A BABY SHOWER FOR MY DAUGHTER AND I'LL BE MAKING THE SAME THING!